No class tonight – I am observing International Women’s Day. Please see the first and last part of this post for ways to participate as well. See you on the mat this Saturday or next Wednesday. Women (& People who Love Women) on Strike! On this day, we will wear red in solidarity with our sisters to celebrate the social, economic, cultural and political achievements of women. We will be highlighting issues and barriers that women face in NC with equal pay, health care, reproductive rights, paid leave and immigration. Our voices will not be heard if we do not take a stand for all women, even as we center women who have historically been pushed to the margins– women of color, queer women, trans women and genderqueer people, women with disabilities, immigrant women, and mothers. For more information call: Gloria De Los Santos at Action NC 919-794-8210 or 919-672-5549 or email: gloria@actionnc. Call in to Protect our Right to Protest! Republicans are introducing bills in at least 18 states (including NC) limiting the general right to protest, and this bill is part of a campaign to shield those in power from principled opposition. The bill calls this nonviolent movement “economic warfare” and is part of a broader pattern of criminalizing People of Color-led justice movements. The NC House Pensions & Retirement Committee is scheduled to hear the bill. Join us to let them know: stop repression of social movements, we have the right to boycott! More details and call-in info here. Come out Wednesday night – bring the kids – for a fun, interactive interest meeting to start a chapter of the International Womens Fightback Network. Feel free to bring snacks to share! The Women’s Fightback Network is a grassroots alliance of poor and working women, immigrants, disabled activists, students, elders and youth, lesbian, bisexual, trans kinfolk — all standing together to end racism, sexism, anti-LGBTQ and anti-muslim bigotry, and for workers and immigrant rights. Our solidarity is a powerful weapon against Trump’s anti-people agenda. I had intended to sit down before today – Wednesday, March 8 – to reflect and write about why I feel moved to join the strike in honor of International Women’s Day. Something stopped me. If I spend too long trying to figure out what it is, I probably won’t get this post written and I sure won’t make it out to the Durham solidarity action at 9:30am. So I’m going to take a wild guess at what has stopped me – but it won’t be so wild since it’s the same thing that stops me much of the time these days – fear. I have been afraid that participating in this day of action would result in being maligned, judged as privileged or labeled as elite or out of touch. I was afraid to join something that may be associated with the much-critiqued and certainly polemic Women’s March. I was afraid to cast my lot with an effort that I cannot personally guarantee is 100% intersectional. 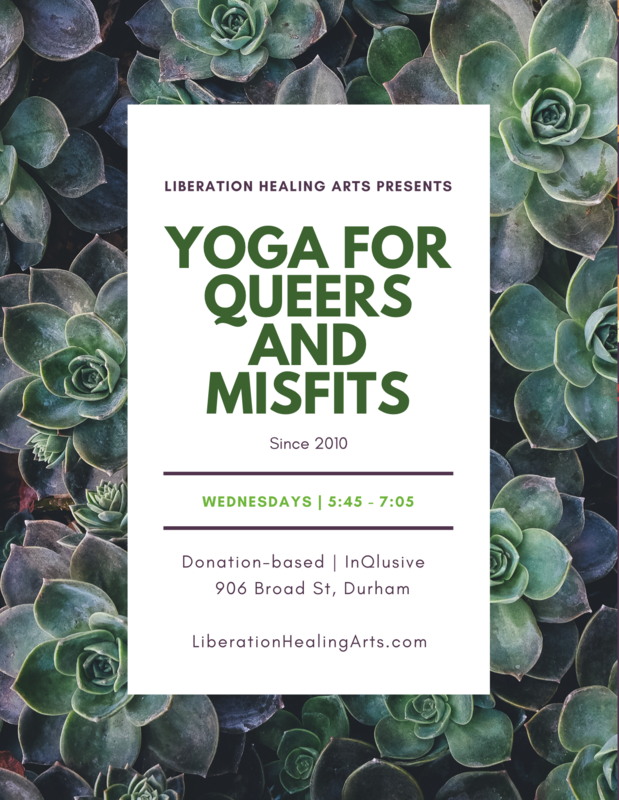 Something moved me to make the decision that I would join in my own way – by not teaching my two weekly, donation-based community yoga classes tonight and by showing up for local actions. (Please see above and below for ways I plan to practice, despite not offering my classes. I invite you to practice too, to observe this day in what ever way you are able). Lately, my identity as a woman has not been the most central to me. I have identified much more with being queer and with being a white person trying to dismantle white supremacy and work towards racial justice and collective liberation. I honestly did not feel any great sense of pride at the possibility of The First Woman President, since I hold the entire office – and indeed the government and establishment as a whole – in such critical contempt, and since HRC was and is a paragon of neoliberal elitism synonymous with the kind of disaster capitalism that is only a slightly less accelerated but no less devastating version of the kind that 45 and his cronies is currently unleashing with abandon. In the end, all trains–whether freight or bullet — reach their destinations. Something moved me to really observe this International Women’s Day for the first time in nearly a decade. When I lived in Central America, the international nature of the day was inspiring and uplifting. The urgent need to converge as women was crucial. Working alongside peasant women in rural communities, or workers in sweatshops, or queer women organizing in universities, or guerrilla veterans from the recent civil wars, or feminist organizers working for reproductive justice, worker rights, and an end to human trafficking and domestic violence, the allure and the significance of organizing as a women alongside other organized women was undeniable. And the power in doing so was palpable. In every movement, across every issue and in every place where injustice occurs, women – cisgender and especially transgender – bear the brunt not only of being disproportionately targeted by the intersectional but fundamentally patriarchal, cissexist and misogynist manifestations of oppression, but also of being always among the vanguard of those fighting back. I can see this with crystal clarity no matter what movement for justice I am examining, past or present. I find myself called once again to acknowledge the international and intersectional nature of this day. I stand, show up, turn out, act in solidarity with women and those who value women from more than 50 countries across the world and Global South, including several Central American Countries. I will stand in Durham alongside folks who acknowledge that women’s rights are human rights, that every issue is a feminist issue because where there is injustice, there are women, surviving and fighting back. I will practice in my own way. I will observe this day as one would a sacred holy day, for that is how I am coming to understand it. Access CTZNWELL’s special page for resources and actions here. This entry was posted in Uncategorized and tagged all-levels yoga, anti-oppression, anti-racism, community based yoga, daywithoutawoman, donation-based yoga, durham yoga, inclusive yoga, international womens day, intersectional, intersectional feminism, lgbtq, lgbtq yoga, patty adams, presence, queer yoga, queer yoga in durham, resistance, social justice, social justice yoga, yoga, yoga for queers, yoga for queers and misfits, yoga in durham. Bookmark the permalink.